There is no doubt about it, this is definitely Terry Pratchett. “Making Money” is the second novel in the Moist von Lipwig series, and as expected Moist gets fleshed out a bit more, and in the process is groomed for more roles in the future. But there is something missing, I just can’t put my finger on what. The gut-wrenchingly funny, laugh out-loud moments are just not there. The surreal as been replaced by rational logic, and the clever wordplay almost non-existent. So what? It’s still Terry Pratchett, almost every page has an absolute gem. Lord Vetenari – the scheming totalitarian ruler of Ankh-Morpork – and it is an absolute joy to see him in action. However some of the some of the “Watch” series characters are there solely as “generics” – Captain Carrot and Commander Vimes come across a being particularly flat. 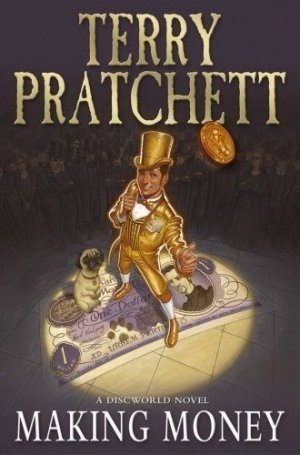 However some old favourites like Cut-Me-Own-Throat Dibbler and Mrs Cake appear in glorious technicolor; and of course what would Discworld be without DEATH making “his” obligatory appearance. The focus seems to have shifted from the madcap invention of the early books. Terry, through Vetenari, now seems intent on a modernisation program for the city and takes us along for the the ride, uncovering snippets of previously unguessed detail in the process. 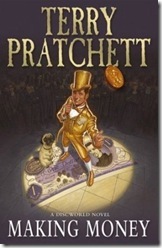 All in all, I will still be hanging-out for the next Discworld instalment.